Identification. As a Spanish colony, the area was formerly known as Spanish Guinea. There are two main cultural and ethnic traditions: the Fang, on the mainland, and the Bubi, on the island of Bioko. Location and Geography. 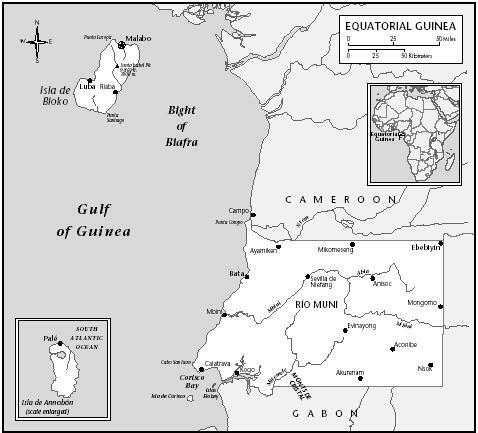 Equatorial Guinea is on the west coast of equatorial Africa, bordered by Cameroon to the north and Gabon to the south and east. The country's total area is 10,830 square miles (28,050 square kilometers; slightly smaller than the state of Maryland). This includes the mainland portion (Río Muni), as well as three coastal islets (Corisco, Elobey Grande, and Elobey Chico) and two islands (Bioko and Annobóon). The larger of these is Bioko, formerly known as Fernando Po. It lies 25 miles (40 kilometers) off the coast of Cameroon, across a bay of the Gulf of Guinea known as the Bight of Biafra, to the northwest of the continental portion of the country. In Río Muni, coastal plains rise to hills, and then to plateaus farther inland. Bioko has three extinct volcanic cones, which contain several crater lakes. Mangrove swamps lie along the coast of the island. Río Muni is mainly tropical rain forest and is home to a variety of animals, including gorillas, chimpanzees, monkeys, leopards, elephants, and crocodiles. However, the wildlife population has suffered greatly as a result of hunting. Demography. As of 2000, the population is 474,214—80 percent of whom live on the mainland, and of that group, 90 percent are Fang. The original inhabitants of Bioko are of a group called Bubi, descendants of mainland Bantu tribes. Bioko also is home to descendants of former slaves who were freed in the nineteenth century. Many Bubi have recently immigrated to the continent, and along with other, smaller Bantu-speaking tribes, comprise the remaining 10 percent of the population in Río Muni. Minority tribes include the Kombe, Balengue, Bujebas, Ibo, and Ibibo. There is a small group of Europeans (fewer than one thousand), most of them Spanish. Linguistic Affiliation. Spanish and French are the official languages of Equatorial Guinea, although a very small percentage of the population speaks either of them. Pidgin English is also used as a lingua franca, particularly on Bioko. Most people's daily lives are conducted in tribal languages, either Fang, Bubi, or Ibo, all of which are in the Bantu family of languages. Symbolism. The coat of arms (which is depicted on the flag) has six yellow six-pointed stars, which stand for the mainland and the five islands that comprise the country. It also includes a picture of a silk-cotton tree. Emergence of the Nation. People of the Pygmy and the Ndowe tribes were the first inhabitants of the area that is today the mainland of Equatorial Guinea. Bantu peoples began to arrive in the twelfth and thirteenth centuries, beginning an ongoing history of tribal wars. The Fang, the most prevalent and warlike of these tribes, predominated. In the seventeenth and eighteenth centuries, the slave trade by the British, French, and Dutch pushed the Fang inland, away from the coast. the end of the 1700s, Spain acquired a large area of Africa from Portugal in a trade; this area included both Río Muni and Bioko. Bioko was important as a slave trade center, thanks to flourishing cocoa plantations there, and was one of Spain's most profitable territories in Africa. However, the island was administered by the English from 1827 until 1858, at which point the Spanish takeover became official. Spanish rule of the mainland did not begin officially until 1926, despite their long-standing claim to the area. It was only at this time that they began to expand into the interior of Río Muni, territory previously unexplored by Europeans. When the Spanish Civil War ended in 1939, the Spanish began to invest more in the development of Equatorial Guinea. The country experienced increasing prosperity with the aid of the Spanish government and the Catholic Church. Industry grew, and cocoa and timber contributed to a strong economy. In 1963 Río Muni and Bioko were officially united as Equatorial Guinea, and Spain granted the country partial autonomy. Independence was declared in 1968. However, when Spain pulled out, they left the country in dire straits; violence and economic upheaval ensued, and the fledgling nation declared a state of emergency. The first president, Macias Nguema, ruled as a dictator for eleven years, outlawing all political parties but his own. In 1972 he declared himself ruler for life, presiding over a regime that killed and tortured thousands of its own citizens. Dissidents were sent to work camps or executed, priests were thrown in jail, and schools and churches were shut down. Journalism was declared a crime punishable by death. During this time, Equatorial Guinea had little contact with the rest of the world. By the time of his ouster and subsequent execution in 1979, Macias had managed to kill or force to flee two-thirds of the population. The coup in 1979 put in place President Teodoro Obiang Nguema. He is part of the same small Fang subclan as Macias. Today the country is still attempting to rebuild and to establish a degree of political and economic stability. However, its record continues to be marred by human rights abuses. Elections have been held, but there are widespread suspicions of vote-rigging. The first presidential election, held in 1993, saw the arrest and imprisonment of an opposition leader. The government later released him under pressure from a number of Western countries. National Identity. Equatorial Guineans identify first with their tribe or ethnic group, second with the nation. The current country was formed during Spanish rule, linking the main island of Bioko with the mainland territory, despite the fact that the two were culturally distinct. Since the unification of the two, there has been some intermingling and migration, particularly of mainland Fang to Bubi-inhabited Bioko. The Fang tribe itself is not limited to the Río Muni area, but extends also north into Cameroon and south into Gabon. Ethnic Relations. Legally there is no discrimination against ethnic or racial minorities, but in practice this is not the case. The Bubi have experienced persecution under the postindependence government. Prior to independence, the group formed a majority on Bioko. However, since 1968, many Fang migrated to the island, and a small subclan, the Mongomo, has dominated the government. There is resentment and violence not only between the Bubi and the Fang but also between the Mongomo and other Fang subgroups. Immigrants from Nigeria, Ghana, and francophone Africa also are victims of discrimination and police harassment. Thirty-seven percent of the population is urban and 63 percent is rural. On the mainland, the population is dispersed fairly evenly, with the exception of Bata, which is the largest city in the country. Many of its buildings are in the Spanish colonial style and are less than perfectly maintained. Bata is a busy commercial center, with markets, bars, and restaurants. The second-largest town in Río Muni is Ebebiyin in the northeast, near the Cameroon border. On Bioko, the majority of the population lives in Malabo, which is Equatorial Guinea's capital. The city is fairly clean, and its architecture exhibits Spanish influence. There are shantytowns as well as upper-class neighborhoods, often in close proximity to each other. Luba, with a population of one thousand, is the second-largest town on Bioko. Food in Daily Life. The main foods are cassava root, bananas, rice, and yams. People supplement their primarily plant-based diet through hunting and fishing. Palm wine and malamba (an alcoholic drink made from sugarcane) are both popular. Food Customs at Ceremonial Occasions. Chicken and duck are usually served at special occasions. Basic Economy. The economy has grown significantly in recent years with the discovery and tapping of oil reserves. Other important contributions to the GDP are forestry, fishing, and farming. Most people support themselves through subsistence farming, growing rice, yams, cassava, bananas, and palm oil nuts. Sixty-six percent of the population works in agriculture, 23 percent in services, and 11 percent in industry. Land Tenure and Property. Most businesses are owned by government officials and their families. Commercial Activities. The main goods produced for domestic consumption are agricultural. Bananas, cassava, coconuts, and sweet potatoes are all grown and sold locally. Much local commerce is conducted using the barter system. The country also produces timber and national gas for its own use. Major Industries. Before independence, Equatorial Guinea's main source of income was cocoa production, but it was grown primarily by Spanish colonists, and with their departure, production fell significantly. Forestry cannot keep pace with its preindependence production rates either, as the departure of the Europeans also meant the departure of funds for the industry. The fishing industry was formerly under the control of the Soviets but is currently being developed by Spain, Nigeria, and Morocco. Trade. Equatorial Guinea's only exports are petroleum, timber, and cocoa. Its main imports are petroleum and manufactured goods and equipment. The primary trading partners are the United States, Spain, France, China, Cameroon, and the United Kingdom. Division of Labor. There are few specialized or high-status jobs in Equatorial Guinea. While there is a legal working age of eighteen, this is not enforced, and many children are engaged in farm work and street vending. A significant amount of work is performed by prisoners, who are forced to labor both inside and outside the prisons. Classes and Castes. The vast majority of the population is poor. The few positions of higher status are generally held by members of the Fang tribe, in particular the Mongomo subclan that controls the government. Symbols of Social Stratification. In the cities in particular, Western dress is not uncommon. Poorer or rural people (women especially) are more likely to wear the traditional West African attire of brightly colored patterns. Government. Equatorial Guinea declares itself a multiparty democracy, although in practice it is a dictatorship under the leadership of the Democratic Party of Equatorial Guinea (PDGE). The legislature consists of the unicameral House of People's Representatives, a body of eighty elected officials. The president appoints a cabinet. In practice he exercises strong control over all aspects of the government, including the legislative and judiciary branches. Leadership and Political Officials. The relationship of the people to their government is one of subjugation and fear; the country has no history of democratic processes, as leadership passed from colonial rule to a dictatorship. Social Problems and Control. The legal system is based on a combination of Spanish law and the tribal system. Violent crime (and even petty theft) is rare compared to rates in other African nations. The government greatly restricts the rights of its citizens. The judicial system does not ensure due process, and prisoners are often tortured. The government has a record of arbitrary arrest, interference with privacy and family, restriction of movement, and lack of freedom of speech, press, and religion, among other abuses. Military Activity. The military is made up of an army, navy, air force, rapid intervention force, and national police. Males are eligible to serve beginning at age fifteen. The country spends $3 million (U.S.) annually on its military—0.6 percent of its total budget. The armed forces also receive aid and training from Spain. The family is responsible for most forms of social welfare, including caring for elderly and sick members. There are nongovernmental organizations (NGOs), mostly affiliated with the church, such as the Catholic Caritas; however, the government has restricted the functioning of NGOs and does not allow them to act in the area of human rights. Division of Labor by Gender. Traditional gender roles still hold sway; it is rare to see women employed outside the home in typically male jobs. They are responsible for domestic labor and child care, although rural women also work in agriculture. The lack of women in professional jobs is perpetuated by inequalities in education: The average female receives only one-fifth as much schooling as the average male. The Relative Status of Women and Men. Although legally granted equal rights, women are in many respects considered second-class citizens. Their status is little higher than that of children, and women are expected to defer to men in general, and to their husbands in particular. Violence against women is common, especially spousal abuse. Women have the right to buy and sell goods, but in actuality women own little property. The Pope visits Bata. Eighty percent of Equatorial Guinea's population is Roman Catholic. Domestic Unit. Extended families often live together. When a couple marries, it is traditional for them to move in with the husband's family. Inheritance. Tribes follow a custom of primogeniture, passing on inheritance to the oldest male child. Although it is legal for women to inherit property, in actuality this rarely happens. Kin Groups. The Fang are exogamous (they marry outside the clan), whereas the Bubi are endogamous (they marry within the clan). In ancient times, it was even acceptable for a brother and sister to marry, as long as they did not share the same mother. Child Rearing and Education. Among the most important lessons children are taught is to respect and obey their elders. Formal education is mandatory between ages six and fourteen. However, only 70 percent of children attend primary school, and even fewer continue on to the secondary level. There are no provisions for children's welfare, and child labor is an ongoing problem, which the government has not addressed. The literacy rate is 79 percent— 90 percent for men and 68 percent for women. Higher Education. The country has two institutions of higher learning, one in Malabo and one in Bata, both run by the Spanish National University of Distant Education. Often, those who can afford it often send their children abroad to Spain or to France to complete their education. Greetings are an important and often lengthy form of social interaction. They usually involve shaking hands. People stand close when talking, often touching or holding hands. Elders, professionals, and those in positions of authority are treated with particular respect and deference. Religious Beliefs. It is necessary for the Ministry of Justice and Religion to approve a religious organization before it is allowed to practice. The government is wary of the Catholic Church, as it has a history of criticizing human rights violations. Nonetheless, Catholic religious study is part of public education, and 80 percent of the population is Roman Catholic. The other 20 percent have held on to their traditional beliefs, and even many who nominally subscribe to Catholicism continue to follow traditional religious practices. There are a few Muslims, mostly Hausa traders in the region. The indigenous beliefs are animist, attributing spiritual energy to natural formations such as rivers, mountains, and trees. Religious Practitioners. Sorcerers are the leaders of the indigenous religion and occupy an exalted position in the community. Catholic priests occupy a position not just as religious figures, but often as voices of government opposition as well. Many have been arrested and tortured for speaking out on human rights abuses, social injustice, and corruption. Rituals and Holy Places. Most rituals involve music and dance. One rite, known as the abira, is intended to purge evil from the community. One Bubi ceremony involves placing a pot of water at the entrance to the village, asking good spirits to protect the people and to bless them with more children. Death and the Afterlife. In the indigenous religion, ancestors are venerated. They are said to live in a place called Borimo, and are thought capable of exerting influence on the living. Bubi villagers often place amulets such as animal bones, feathers, and shells several hundred meters outside the village in remembrance of their dead. Health conditions in Equatorial Guinea are not good, and are made worse by lack of adequate sanitation. There is a high infant mortality rate, and the life expectancy is only fifty-three years of age (fifty-one for men and fifty-five for women). Common problems include malnutrition and malaria. The health system concentrates on preventive medicine, but this cannot compensate for the severe lack of supplies and trained personnel. These are New Year's Day, 1 January; Armed Forces Day, 3 August; Constitution Day, 15 August; Independence Day, 12 October; and Human Rights Day, 10 December. Literature. The literary tradition in Equatorial Guinea is oral rather than written. There is a wide range of myths and legends that are passed on from one generation to the next, some meant to preserve the history of the tribes, others to explain natural phenomena. Sorcerers and witches often figure prominently. Graphic Arts. Equatorial Guinea has a tradition of sculpture and mask-making. Many of the masks depict crocodiles, lizards, and other animals. Fang art is known for its abstract, conceptual qualities. Performance Arts. Music and dance are central elements of Equatorial Guinean culture, both Fang and Bubi. Many of the songs and dances have religious significance. Drums are a common instrument, as are wooden xylophones; bow harps; zithers; and the sanza, a small thumb piano fashioned from bamboo. The accompaniment to a dance usually consists of three or four musicians. The balélé dance is usually performed on Christmas and other holidays. The ibanga, the Fang national dance, is popular along the coast. Its movements are highly sexual. The men and women who perform it cover their bodies in white powder. The few facilities for physical sciences in Equatorial Guinea are affiliated with the fledgling petroleum industry and its development. "The Army Is Mobilized." Earth Island Journal, Winter 1999–2000. "Country Report: Gabon, Equatorial Guinea." The Economist Intelligence Unit, 1993. Fegley, Randall, comp. Equatorial Guinea, 1991. Klitgaard, Robert. Tropical Gangsters, 1999. Liniger-Goumaz, Max. Historical Dictionary of Equatorial Guinea, 1988. ——. Small Is Not Always Beautiful: The Story of Equatorial Guinea , 1989. Perrois, Louis, and Marta Sierra Delage. Art of Equatorial Guinea: The Fang Tribes , 1990. Reno, William. "Clandestine Economies, Violence, and States in Africa." Journal of International Affairs, Spring 2000. Rwegera, Damien. "A Slow March Forward." The UNESCO Courier, October 1999. Sundiata, Ibrahim K. Equatorial Guinea: Colonialism, State Terror, and the Search for Stability , 1990.
this has helped me with two big prodjects due in only a week. Thank you for the help!!!!! this article is very fantastic.i m reasearch scholor of banaras hindu university,varanasi,india.iwant some information about religion ,religional practises as well as crime rate in african countries.i want some help of your side.kindly help me. thanku sir. This is a really great article...i'm doing a report on this for spanish and this article really helped! I got an A+++ onmy 75% of my grade project THANK YOU A LOT!!!!!!!! this page is like the best thing ever!!!!!! iv had to research loads of all this really dense info just to get the simple answers you gave. If only id found this page sooner :( Thanks alot though, youv prooved that Equetorial Guinea in all its mess can be simplified to a certain extent. omg this helped me out of my spanish project so much! i had never heard of this place before in my life, but now i know a lot thanks to you! This site was a great help for my Spanish project. I would have got a bad grade if it wasn't for this site. So thank you to the creators. This site is really great.I have a project i am suppost to do and this websitre gave me alot of info for the project. Thanks for the info! I'm using it for my spanish presentation. Randomly selected this country since it was in Africa. Haven't read all of this article, but I'm sure it will be helpful. Thanks and God bless. Thank you for providing this information. I teach a class to children about Mission friends and we learn about other countries who don't have alot. I found alot of this information useful. This article was well written, complete, and very useful in a project that I am putting together with my students. Thank you very much. Thank you so much. 90% of my project is from here. You're my life saver. I am inrigued by this country, I was required to do a project on a Spanish Speaking country for my Spanish class and on the list of countries we could choose was this one. I had never heard of it so I chose it, I will Deffinitely continue researching and my prayers go out to these people. I am doing a study on this country and this information was very, very helpful although I would like to know what their national things are e.g. national food, clothing etc. This article was REALLY helpful to me. I am in 5th grade and I was doing a project on a Spanish-speaking country of my choice, and I was totally stuck. Now I'm on a roll! Thank you, Eleanor! I bet I'm going to get a really good grade! I'll probably get so good I'll overlap and go back to Z! Just kidding. Very informative. I think it gave an excellent synopsis of the history and cultural diversification of Equitorial Guinea. thank u i needed alot of information that was on here for my project and it really helpt me out. THANK U!!! Could you please give me a proper work cite on this article? I am writing a report about the Fang tribe. If you know where I may also find more in depth information on the Fang tribe that would be wonderful! Thank you for the information provided. Thank you! I would like to know more about catholic priests in the country. Where are they trained? What explains their courage to criticise the government even when they are in danger of arrests and torture? 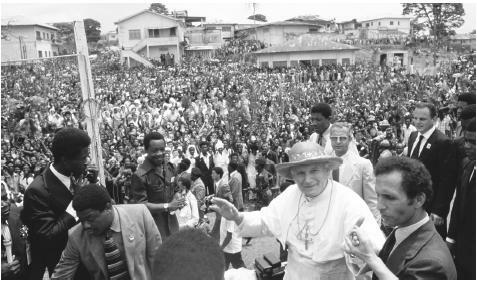 is there any school of catholic theology in equatorial guinea? are there some significan theological voices among the priests? This article was really good, but part of my research required that I list cultural attractions around the country, and things that the country itself is known for. As it is, I am the only one doing research on this country and I would like it to be the best for me, and anyone else who visits this site. Please find out about attractions, tourist information, and what visitors can do while in Equatorial Guinea. Other than that thank you for all the information provided, it's always nice to find that one site that gives almost everything. This really helped me fill in some holes of my project information, but I am still missing a lot of things. I haven't really been able to find anything about their national sport, tourist sites, music, nature and common animals. this helped so much, just what i needed for my presentation! This really helped on my spanish project. I Got an A. Thanks for the info. It really helped. Helped on my project. i askd for music in equatorial guinea an d i couldn't but other wise good. thank you this helped alot got a few things to still search for, for my french project but thanks! Mostly helpful, if somewhat inaccurate information. Most people assume these countries to have terrible conditions, but I have not found this to be the case in this country. This really helped on my brochure for Geography. First one to comment in 2014! This really helped me completing my business communication assignment, thanks! This realy helped me on my research project for the youthgames coming soon..,thanks a lot! Good facts, organized. It's perfect for research.It helped me a lot on my Spanish project. Thanks! Thanks very much i hv always want to knw more about places i haven't visit and dis really great.